No more M23. The end of an era? And what’s next? Few hours after the first rumours (initial public source seems to have been North Kivu governor Julien Paluku) announced the capture of Runyoni and Cyanzu by UN-backed FARDC troops (Mbuzi, the third hill under M23 control during the last week has been taken some 24-48 hours before). On November 5 early in the morning, the remaining M23 forces reportedly left their positions and fled. Unconfirmed accounts indicate the movements’ senior command has dispersed to both Uganda and Rwanda, while rank-and-file soldiers surrendered to FARDC or went into hide. The phone contacts of various senior commanders, including Sultani Makenga, have been off since November 4 late afternoon. The rebel movement’s political leadership, after having announced a unilateral ceasefire before, issued a statement officially ending M23’s existence as an armed opposition movement in eastern Congo (see twitter screenshot). In social media, the military branch of the movement has defied rumours of complete disband among the rebel’s armed wing. On the validity of these announcements, no final judgement is possible at this time while it seems likely that big parts of the remaining few hundred combatants either left DRC territory, surrendered to FARDC, or dispersed into the Virunga forests. Overall, a few things can be said, while a bunch of questions remain open. The military end of M23 may well signify the final stage of what has been an ‘era of armed movements’ in eastern Congo. Particularly in terms of personnel, the continuity from AFDL, RCD-Goma, CNDP, and M23 is striking. Sultani Makenga, the movement’s commander for instance has been part of all these rebellions. Similar for others, such as Vianney Kazarama, Yusuf Mboneza, Innocent Kayina etc. (some of them may not have been part of AFDL and temporarily in other groups such as UPC or PARECO, but in gross this is it). This does not mean, however, that underlying problems are solved. Despite observable improvements of FARDC capacity to conduct operations and increased willingness of MONUSCO under Kobler and dos Santos Cruz to actually weigh in through its Force Intervention Brigade (as Darren Olivier well described) the root causes and grievances may be left unaddressed again, if a political agreement does not add up to what happened on the battleground. As it is the case with numerous other communities in eastern Congo, the so-called ‘Congolese Tutsi’ of North Kivu (more precisely, big chunks of the Banyabwisha, Banyajomba, and others) need to be given political and social representation. The same applies to others, obviously. As long as land and citizenship issues are not taken seriously a ‘new M23/CNDP’ remains possible, even if the genealogy of leadership seems to be broken from today. More so, DDR – with a particular focus on reintegration – is urgently needed, not only for M23 but also other Congolese armed groups (see the various Usalama Project reports) and in the form of DDRRR. While the latter is currently carried out by MONUSCO and working not that bad despite inherent challenges, the disarmament, demobilisation, and reintegration of Congolese combatants has been stalled for years after massive failures had marred to previously government-led and internationally-sponsored programmes. As a third point, it is now more crucial than ever, that both FARDC and MONUSCO (through the FIB) also engage with other groups, in particular FDLR as the most longstanding threat to civilians, in order to keep power imbalances that may result in the emergence of local security dilemmas as small as possible. In addition, MONUSCO needs to rethink its ‘islands of stability’ idea that may possibly turn into a ‘swamps of instability’-reality if cleared areas are not sufficiently covered by either blue helmets or responsibly acting FARDC units. The Congolese government, most visibly represented by its spokesperson Lambert Mende, has announced a landslide victory over the M23 which has been humiliating the Kabila government and the country’s armed forces not even a year ago by taking Goma. Mende announced FARDC would now take on all other armed groups (based on various mapping exercises I did, we speak about 50-60, grossly). Officially, the government has committed to a continuation of the Kampala Talks such as demanded by M23’s political leadership around Bisimwa and Abandi. In Kinshasa however, billboards hailing the victory of President Kabila and the FARDC, as well as (probably government-sponsored) women’s marches tell a different mood. On its side, MONUSCO saluted M23’s defeat, or capitulation, and underlined its responsibility of neutralising all negative forces in the area. While it is too early to predict the Force Intervention Brigade’s future actions, most observers have identified FDLR, Mayi Mayi Sheka (NDC), and the Allied Democratic Forces as potential next targets. Cognisant of the huge expectations, yet now as the FIB eventually turns out as an effective instrument, MONUSCO’s leadership around Kobler seems wary of not exaggerating verbal warfare. While the UN appears as determined as rarely before quick immediate action against other armed groups should not be expected either. Tracking and tackling other armed groups in eastern DRC is going to be an amazing task for both government forces and blue helmets. Despite a surprisingly swift success over M23, observers cast doubts on whether the FARDC-MONUSCO coalition will be able to similarly live up to expectations when it comes to less centralised and structured militias. In their fight against M23, sniper and helicopter attacks on semi-open terrain (the hills around Rumangabo and Rutshuru are not completely tree-covered) were among the keys to success and steady supply routes from Goma and elsewhere have also helped the advance. This will not be the case for FDLR. Most of the ex-interahamwe group are scattered below large panoplies, divided into a North Kivu (in northern Masisi/Lubero) and South Kivu (south Mwenga) command plus small splinter groups RUD and Soki (most likely both in Lubero/Rutshuru). After Umoja Wetu and Kimia II joint operations against FDLR, the latter’s combatants have been decimated, pushed deeper into the hinterland and forced to learn more decentralised militia tactics. A similar example is the FDLR’s largest current threat, Raia Mutomboki. A widespread semi-structured franchise of numerous militias, Raia Mutomboki mostly consists of part-time combatants that spend most of the time as civilians cultivating fields in Shabunda, Kalehe, or Mwenga. Military operations against such kind of actors need to take into account those specialties and adapt in tactics and equipment. It is yet to become clear whether MONUSCO is that flexible and FARDC is that capable. It should not be forgotten that FARDC’s landslide victory is also based on the fact that 1) command structures around Col. Ndala and Gen. Bahuma have been considerably streamlined, 2) some of the best assault units of the army have been used, and 3) these units have been properly paid and supplied as well. From a cross-border perspective, both Uganda and Rwanda have been extraordinary quiet in terms of comments and statements. A few days earlier, senior figures in Kampala and Kigali had been accusing FARDC of deliberately shelling into their territories (similar to earlier bombing of Gisenyi and its surroundings, there has never been a final confirmation who launched the shells – both M23 and FARDC may have done so). While reactions have been announced should bombings continue, this item now seems to be closed given the battle ended on November 5 early in the morning. So Abdon, you think you are in a position to judge about my work without properly referring to it, not even talking of about the fact that you obviously not know me. Congratulations, so you just qualified for the prize of the most ridiculous reader of my website. Next time, please make sure you comment something meaningful without discrimination of any kind, otherwise it is unlikely to be published. Rules are clear, no defamation or hate speech on this page. Thanks. I cannot believe! This author, whose name ethuin sounds much like “Adui” (enemy in Kiswahili) seems be under the payroll of some Lueshite plunderers! He must have been mediocre in what he has been doing, right before he comes to try to pitifully redeem himself, unfortunately, on our country and its history, which again, he never got to live unlike us, but read from some thousands miles away in a cold winter. I have to disagree strongly with you on most of the points you raised here. Yes there are several armed groups in EDRC but none of these is as significant as M23. I say this because none of these armed groups have external backing like M23 had from Rwanda (see UNSC GoE reports)1. None of these groups has a developed network of support compared to that M23 put in place before its start in 2012 (see proceedings & reports from the trial of Col Byamungu et al. at Bukavu military court)2. None of these groups have threatened or has the potential to take the capital city of a province the way M23 did in 2012. To name but a few… in other words, many are quick to mention armed groups in EDRC but inf act when you look at the significance of these armed groups the big majority are simply rural gangs lacking even basic means of communication or transport and can be dealt with by Congolese police now that focus on M23 will decrease freeing up state resources to tackle these groups. Again, the FDLR claim has been exaggerated with the main aim to provide excuses for the very existence of M23. One needs to remember that the Rwandan army has been allowed free access and license to kill in DRC since 1996-1998 (AFDL); 1998-2004 (RCD); 2004-2009 (CNDP); 2009-2012 (M23) to deal with the FDLR threat. Rwandan authorities called one of the operations as a success3. So it is contradictory if not disingenuous to now say FDLR has not been dealt with whilst your government had more than 16 years to finish the job. These claims are simply baseless and are used by those seeking to justify the very existence of M23. Up to the onset of the current military crisis, FARDC was working with RDF to deal with FDLR it is the M23 insurrection that deflected FARDC attention stretching to thin its resources and hence resulting in the suspension of operations against FDLR. 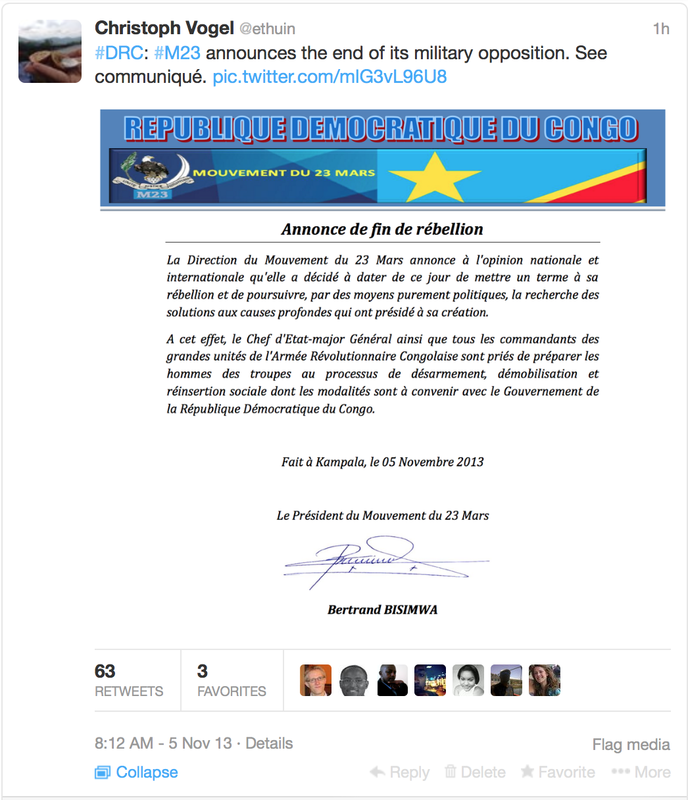 Again this argument is simply not serious and purely irrelevant in the case of the DRC. I say this because most 400 + ethnic groups in the DRC are minority to some extent and individuals from any of those ethnic groups can claim to be victimised. However, none of them will be justified to take up weapons against the nation in the way M23 has done. Adding to that is the fact that the M23 has no mandate to represent any ethnic group in DRC. The chairperson of a group Congolese Tutsis (Shikama) has actually voiced his disapproval with what M23 claim that it was defending the interest of Congolese Tutsis5. This problem is a Rwandan affair and should not be blamed on others. Statistically speaking there are statistically more potential genocidaires inside Rwanda than in any other country of the region. In this respect, I suggest that the Rwandan government come to realise that the solution for lasting peace and avoid genocide is political not military. 16 years military action against FDLR have failed time to try something different. M23 IS ONE OF NUMROUS ARMED GROUP THAT WAS OPERATING IN EASTERN DRC AND ITS END DOESNT MEAN A LOT FOR THE MOMENT. IT WILL HAVE POLITICAL SIGNIFICANCE WHEN MONUSCO AND FARDC AS SOON AS POSSIBLE WILL PROCEED THE SAME PROGRAM AND IN THE SAME WAY ON THE MULTIPLE ARMED GROUPS PRESENT IN EASTERN DRC SPECIALLY FDLR.THE PROBLEM IS THERE AND IT MORE DIFFICULT AS FDLR AND FARDC ARE SINCE A LONG TIME WORKING TOGETHER.IF MONUSCO DOESNT DO THAT IT WILL MEAN THAT UNITED NATIONS HAS MOVED FROM THE PROTECTION OF MINORITIES IN THE AFRICAN GREAT LAKES REGION AND THAT WILL HAVE ENOMOUS CONSEQUENCES ON UN AFTER THE RWANDA GENOCIDE. UN WILL HAVE OPEN WINDOWS FOR OTHER GENOCIDES TO HAPPEN AGAIN IN THE REGION. PLEASE PAY ATTENTION TO THAT OBSERVATION.